Heintzman, Paul. Leisure and Sprituality: Biblical, Historical, and Contemporary Perspectives. (Engaging Culture). Grand Rapids: Baker Academic, 2015. In this well-written book based upon his doctoral dissertation, Paul Heintzman explores the concept of leisure throughout history, particularly as viewed by the Judeo-Christian community. He begins by exploring the views of leisure in today's society. He then takes a look at its history. He then explores what the Bible teaches about the concept of leisure. He then explores the changing concepts of leisure and work and the Biblical view of work. He then takes a look at how Christians have approached leisure. Finally he looks at the importance of leisure in one's spiritual life. Heintzman has done his research, yet his volume remains accessible to both the seminarian and educated laymen in the church who are interested in the subject. The volume is well-documented and well-indexed.This book is likely to be the authoritative work in this field for some time to come. Highly recommended. This review is based on an electronic copy of the book received by the publisher through NetGalley for review purposes. 2015 is my first Father's Day without my father alive. As I began to reflect on Father's Days in the past, I realized that church camp played a big role in how these were celebrated. For many years, our church camp was located about four miles from our home. Even before I was old enough to attend church camp, I was attending the Sunday evening service at the church camp because our church cancelled its evening services so we could attend. Our Wednesday evening services were also often cancelled so we could attend the Galilean service which was an evening chapel service by the lakeside. When I was old enough to attend, my week of church camp often began on Father's Day. The family would pack me up after morning services and get me to the church camp so I could have a good choice of bunks. Mom and Dad would stay with me until after the evening vesper service and then they would head home. Later the camp moved to the campus of a Bible college outside of Senatobia, Mississippi. By the time I was 15 and had my drivers license, I began working at the church camp. My official title was "Canteen Manager." I often performed other duties as well. Needless to say, I was still leaving for church camp after church on Father's Day even though senior high week had passed. When I was in college, I traveled on one of the music teams that went to various church camps. At this point, I wasn't even home for Father's Day. I had to call instead. We usually traveled to camps in Louisiana, Arkansas, Oklahoma, Missouri, Tennessee, and Mississippi. We also attended a denominational convention each year wherever it was located. Kuhns, Eleanor. Death in Salem. New York: Minotaur Books, 2015. 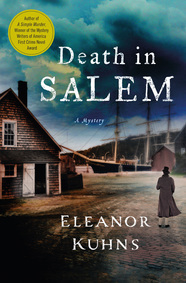 Will Rees is called upon to investigate the stabbing of a Salem shipping magnate named Boothe in this work of historical fiction. Soon other murders follow. Rees follows leads that take him into Salem's tunnels, into the shady part of town called Black Cat, and to other areas. He must also determine if smuggling had a role in the deaths. The novel is a bit conversation-heavy and did not maintain my interest well. Sentences seemed choppy instead of well-constructed, adding to the problems. I suspect that some readers will enjoy this more than I did. Persons who have read the earlier installments in the series might also appreciate it more. The review is based on an advance reader's e-galley provided by the publisher through NetGalley for review purposes. Levy, Lawrence H. Second Street Station. New York: Crown, 2015. Mary Handley, an out-of-work sweat shop employee, is hired as the first female detective by the New York Police department when Charles Goodrich is murdered. The plot includes a "who's who" of the 19th century with Thomas Edison, J. P. Morgan, Nikola Tesla, and George Westinghouse being important in the plot. Even the Pembertons of Atlanta Coca-Cola fame make appearances. Despite the implausibility of the plot, it was entertaining, at least after the opening few chapters, and kept me interested in the outcome. Many of the minor characters seemed to be a little more fully developed than the Mary herself was. Historical mystery fans who enjoy real-life characters inserted in the plot will enjoy this one. This review is based on an advance uncorrected proof e-galley provided by the publisher through NetGalley for review purposes. Reynolds, William R., Jr. The Cherokee Struggle to Maintain Identity in the 17th and 18th Centuries. Jefferson, NC: McFarland, 2015. Author William Reynolds did a masterful job documenting the Cherokee in the 17th and 18th centuries. The book shows the Cherokee's interactions with the white men who came into their region. They lost land to settlers even before removal forced many of them to lands that became Oklahoma. The historical accounts are written from a perspective providing new insights into regional history for most Southeastern States. Readers will recognize names such as John Sevier, Anthony Bledsoe, James Robertson, and Andrew Pickens as they scan the pages. We also gain insight into key Native American leaders such as Piomingo. One minor error was noted in the description of Muscle Shoals' location. Appendices include a listing without documentation of the author's Cherokee ancestry, biographical sketches, villages, and glimpses into Cherokee life. This book belongs in collections with a focus on the Cherokee or on the Southeastern Region of the United States, but it should be of interest to anyone interested in colonial American history or Native American history. The review is based on a complimentary copy received through LibraryThing's Early Reviewer program in exchange for reviewing purposes.